Sweat is running on my face under the glaring sun one day in the middle of July. My friend and I have walked around Sunday Market all morning, and we’re now sitting in a comfortable Japanese-style room in Tosa-cha cafe. Though before noon, it is full of customers of all ages. Cold Tosa tea served as soon as we sat looked like bitter and astringent, but it is easy to drink. Fresh taste cooled me down and I could sense a little sweetness. There is a teapot in which are a few tea leaves cup, pottery and green tea cake on the table. Chartreuse tea is shining in a cup. I’m little confused because of preparation methods of green tea one of staffs taught us. Hot Tosa tea tastes more bitter than the cold one, but it’s perfect with sweet cake. I can’t help saying “This is so good!”. I find that taking enough time and many steps are important to make better tea. I’m feeling the slow-passing time for a long time. Tosa-cha cafe opened last December in Obiyamachi. The concept of this modern cafe is to make new discovery for visitors and make rediscovery for Kochi people of Tosa tea. The cafe serves food, desserts and tea made by local products. I found the comment of a Japanese tea adviser on the menu, it is said that Tosa-cha cafe wants customers to find pleasure of drinking Tosa tea. Kochi prefecture expects this cafe to promote Tosa tea to all over Japan. This is one of new challenges for Tosa tea. Tosa tea has been receiving high recognition for a long time, however, it’s almost unknown to people in Japan. It has been processed and shipped to Shizuoka’s tea market. A major source of Tosa tea is mountain regions near the Niyodogawa Basin and the Shimantogawa Basin. The climate in the mountain region is also good for producing tea. Last year, about 350 tons of tea were produced. But the production of Tosa tea is decreasing year after year because of the price decline of tea and the aging of farmers. The growing areas also decreased by 50% from its peak. Furthermore, tea farmers in Kochi are facing a difficult situation in that their incomes are decreasing. Kochi prefecture is trying to make Kochi’s tea market bigger. And it holds tea festival in spring and fall to make people feel the difference of two kinds of taste. Niyodogawa town produces the most Tosa tea in Kochi, and it accounts for 38% of production. Tosa tea production started in Niyodogawa about 400 years ago. Drinking tea and eating meals had the same meaning among people of those days. Tea was essential in daily lives. Ms.Yamanaka and other 5 women set up Ikegawa-chaen in Niyodogawa town. She is a tea farmer. Last September, she participated in Yataro-akindojuku which invited some product development professionals from all over Japan to learn how to commercialize a new product. She was given two challenges in the workshop. One is to initiate an attractive concept which captures customers’ hearts. 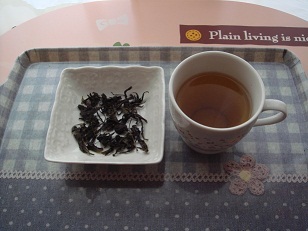 And the other is to create a new product with Tosa tea. After the workshop, she struck on tea pudding. However, it was difficult to make tea pudding at first. Using too much tea powder caused failure of making perfect pudding. So they tried dozens of times with trial and error, finally they succeed to make pudding with as much tea powder as they could. They marketed it at a local hotel, staffs liked taste and appearance very much. The hotel promised to sell pudding in the hotel. Now, sales are growing she is beggining to sell tea pudding on the Internet. Furthermore, Ikegawa-chaen is trying to make other products after the 6 months workshop. Ms.Yamanaka answered the interview, “Before this effort, tea farmers’ work was only to produce tea. But I have a big dream now. I make commercials of sweets and I’d like to be merchant like Yataro Iwasaki. And make people know where Niyodogawa town is.” with a big smile. Her challenge has just started, but Tosa tea will become popular, I believe. It is said that people of today have no time to relax because of busy days. But we need time to have a break for a change. If you eat dessert made by tea and drink Tosa tea, not only you but also Kochi will be happy. Let’s have tea time with Tosa tea this afternoon. Next Imokempi: Hard or Soft? I haven’t try Tosa-tea yet, but your article and pictures make me feel like Tosa-tea. Kochi is full of nature and it’s been producing lots of tasty food like Katsuo no tataki and Yuzu. I hope Tosa-tea will be one of them soon and create relaxing time for all people. I have drunk tosa tea and it taste so nice. And I got interested in dessert made by tea thanks to your article. so I will try it next. Well, I am glad I read your article, Kasumi, as I would not know about the lovely shop you have described. I am very interested in tea and the different types, so I will go and check it out over the holidays. I congratulate you on a very well written article: your description of the shop and tea made me feel like I was there, tasting it with you.